At least I think these are Ulta exclusives, because I haven't seen them anywhere besides Ulta. I could be wrong, it is a little tricky to find Nicole around here. Anyone know for sure? Edit: Whew! They're not Ulta exclusives! Thanks, Sybelle! There was a red with this collection as well, but I didn't get it... It just didn't appeal to me. Maybe when it goes on clearance I'll get it, but it didn't look drop-dead gorgeous like OPI Dreaming of Red. Bah Plum-bug! Muted plum purple with hidden shimmer. This isn't an accurate representation of the color- it's much less blue in real life. Very soft, dusty, muted plum purple. It looks like a creme, but in certain lights, you'll notice that it has a hidden shimmer. The overall look is a greyed-out plum with a hidden reddish-goldish shimmer that only shows in certain lights. Faux Fir. Medium blue-toned green shimmer. I think it's really shimmer bordering on frost. Not a true icky brushstrokey frost, but a really dense fine shimmer. From looking at this color in the bottle, I didn't think I would like it very much, but once I wore it I really grew fond of it. It's even better with Winter Glitterland on top. I do wish it were slightly more yellow toned. Winter Glitterland over Faux Fir. This is my favorite combination. Again, one coat. I've worn this as an actual manicure twice now. What can I say? I just love glitter. And green. And purple for that matter. The formula on these was good. Faux Fir and Bah Plum-Bug! had a very strange consistency... it wasn't thick or too thin, but it felt... fluffy? I don't know how to describe it, actually... squishy, fluffy, unusual. It didn't give me any trouble, but I found it quite strange. I did three coats of polish in these pictures, but only Winter Glitterland needed a third coat. Decent opacity. Good formula. Drying time was average- not fast but not what I would consider long either. The only thing I don't like about Nicole is that damn melted bottle! Overall, I think these are pretty cool. It's not total head-over-heels love but I like them enough to want to reach for them regularly. Out of all of them (the left behind red included) Bah Plum-Bug! is the most unique. I can't think of a match to Faux Fir off the top of my head, but it doesn't strike me as being one of a kind. That's not to say it's bad, it just feels like I've seen it before. I've heard that Winter Glitterland looks a lot like one of those rare Japanese OPI glitters, but I don't recall which one. Purple, green, glitter, cute winter seasonal theme... Yeah, you won't hear me complaining! I just wish Nicole was easier to find! Meijer is carrying Nicole now, so if you have a Meijer, be sure to check there. They aren't Ulta exclusives - I got mine at Harmon. Thank goodness, because there's no Ulta near me and I HAD to have Bah Plum-Bug and the glitter. Your nails are getting long, they look great! We have tons of Nicoles here in Toronto! Shoppers' Drug Mart carries all of the Nicoles in the regular line and limited edition. NancyPower if you are unable to find them, I can take a look to see if there are in yet. These are pretty, but I think I have dupes for both. The glitter is really nice. As for staining, it doesn't look that bad, Scrangie. Mine are always bad in the fall, because of all the reds, browns, and oranges I wear. I think there is a base to those colours that stains, even through my basecoat! Oh god. This was the prettiest I've seen in a long time! The glitter one is amazing! I've seen Nicole polishes at Target stores. I'll have to check to see if they have these though. I totally love Winter Glitterland. So want. That glitter looks awesome over those colors! I don't see any of these as being unique, but they are very pretty! Glitter Wonderland looks almost like jelly glitter. I kind of like the look of it. 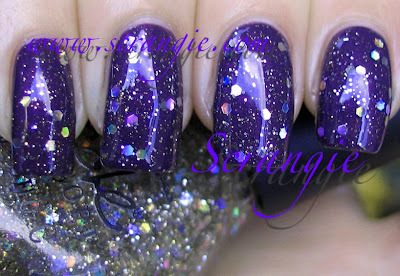 My goodness I LOVE Bah Plum-Bug with the Winter Glitterland on top!!! I want it soooo badly! Also, there were a few Nicoles at my local Wal Mart, that's where I got my "Respect the World" one. Walmart in Canada sells Nicoles too! Winter Glitterland looks the same as the UK OPI release Golden Rainbow. They did this with the heart glitters around valentines too. OPI released them in europe but released the same as Nicoles in the US. Very pretty though it looks great layered over the other two. Walmart carries Nicole, I see it all the time in there. (I don't work for Walmart, my business is inside Walmart tho) I think I may dislike Wlamrt as much as you do tho! I love the name Faux Fir! Although green pleases me, I may have to buy that one for the name alone. Winter Glitterland is such a sparkle fest. I never tire og glitter top coats. Long live hex glitter! Ooooh, these are pretty. I'll have to check my local Target, I've seen Nicole there before. If they don't have them, Ulta it is. Good thing they're in the same shopping center! Now you make me WANT the winter glitterland, haha. Soooooo pretty!!! You are an evil temptress of tempting evil. Winter Glitterland was sold out at the Ulta I went to last night. I was disappointe, but I noticed another aisle had something just like it from the Cover Girl Boundless Color: shade 405, Disco Dazzle. I'm lazy and really didn't want to read all comments here so I don't know if somebody told this yet: stop saying your nails are stained! I started looking for stains and even so found none. hahahah I really think it's something only you can see and up close lol. oh, and this green is marvelous. The blue one isn't that uncommon (for me in Brazil), but this tone of green there's just nothing to compare around here. I'm loving that green. I love Glitterland over the other polish. Very pretty.